On domestic, US Airways have different food according to the length of the flight. 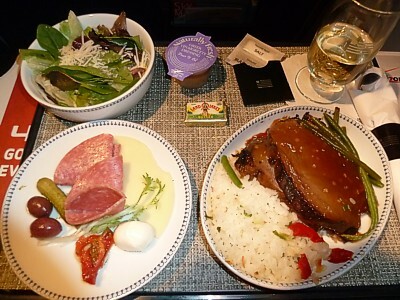 US Airways have scrapped free inflight meals for all domestic flights in economy. There is absolutely nothing on any flight of less than two and a half hours. In ecnomy, above 2.5 hours, there is US Airways's MarketPlace, which is US Airways's pay as you eat service in the back of economy (coach class). Above 3.5 hours, and you can buy more uprated meals. 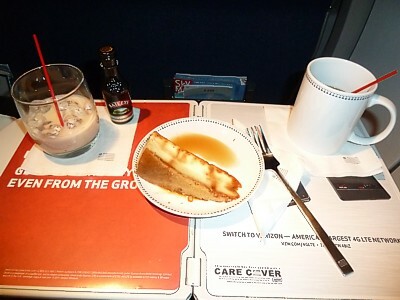 In First (domestic premium class) above 2.5 hours there is a free hot meal: above 3.5 hours there is also a dessert. The US Airways Menu is in the seat pocket infront of you, however it is not available online, so you can't check out prices before hand. There are normally two trolleys on the plane, one which starts at the front, and the other at the back. Hence, if you want to get your food first, and have some chance of eating it before you get off the plane, you'll need to sit either right at the front, or right at the back. It is quite extraordinarily expensive to eat or drink on US Airways as a foreigner. Beware that US Airways don't really cater for non-US passengers on domestic flights (and flights to Canada, Mexico, & South America). Not only is it a real pain trying to book these flights, but once on board, you'll find they only accept credit cards. A UK or Australian credit card will accordingly have a 'foreign transaction charge' added to this, and to add insult to injury, you can't buy more than one beer at a time to only pay one charge. Hence, each beer will cost you nearly US$20. Thankfully on flights to the UK, US Airways now accept cash, following thousands of complaints. Three slices of beef, with fragrant Thai rice, string beans and gravy. Cold plate of cheddar and feta cheese, salami, dried tomato, two olives and a gerkin. Salad bowl with iceberg lettuce and sprinkled parmazan cheese. A tub of dressing. A pat of butter. Hot pecan pie, drizzled with custard. 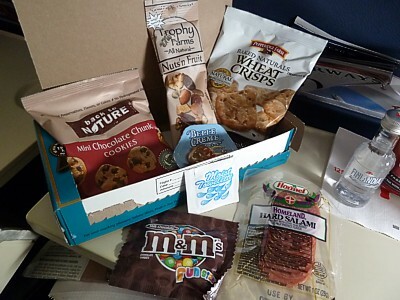 A snackbox with Back to Nature mini chocolate chunk cookies, Pepperidge Farm bakes natural wheat crisps, Trophy Farms all natural nuts n' fruit. Hormel salami, Belle Creme gourmet cheese spread, and a packet of M&M funsize milk chocolate candies.